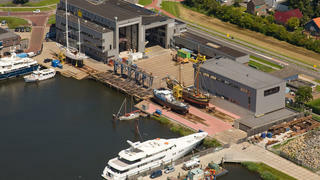 Refit specialist Balk Shipyard has announced that it has purchased Jachtwerf Bloemsma from former Claasen owner Jan Hart. As part of the mutually-agreed sale, Jan Hart will remain as managing director of Bloemsma Aluminiumbouw and “keep his focus fully on the aluminium constructions”. Based in the Dutch village of Makkum, Bloemsma is best known for its work on aluminium hulls, such as 24.31 metre motor yacht Griffioen and the 40.75 metre Ed Dubois-designed sailing yacht Valquest. Its sale comes in the same year that Jan Hart sold sailing yacht builder Claasen Jachtbouw to the Vitters Shipyard in Germany. Balk Shipyard has been a family-owned business for seven generations and current owner Daan Balk said he had “been familiar” with Bloemsma’s fine work for more than a decade. Current projects at Jachtwerf Bloemsma include refits on 24.54 metre Bloemsma & Van Breemen sailing yacht Mulligan and 22.8 metre Claasen cutter Copihue. Meanwhile, Balk Shipyard is currently working on the third refit of the classic 44.2 metre Feadship yacht Valeria and an unnamed 50 metre superyacht for Amels, having already completed the second refit on 46.48 metre Palmer Johnson expedition yacht Pioneer earlier this year.